15 1/2 by 25 1/4 in. ; 39.4 by 64.1 cm. Thence by inheritence to his wife, Lúcia Moreira Salles, New York. 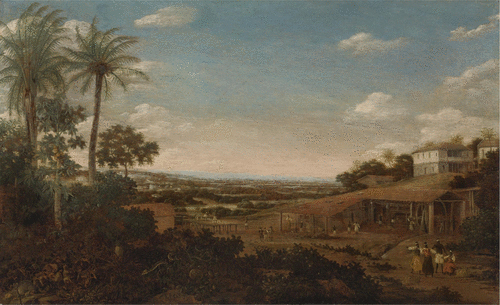 Sao Paulo, Museu de Arte de Sao Paulo, Frans Post (1612-1680). Obras de coleçoes paulistas, 1973. A. Guimaraes, "Na Holanda com Frans Post," in Revista do Instituto Histórico e Geográfico Brasileiro, 335, 1957, p.
P. Corrêa do Lago, Frans Post: 1612-1680, Milan 2007, p. 282, no. 107, reproduced in color. The present painting depicts a Brazilian sugar mill and plantation house set in a lush tropical landscape. Paintings such as this by the Dutch artist Frans Post both satisfied and helped to feed the growing seventeenth century European curiosity about the New World and the exotic peoples, plants, and animals that inhabited Holland's distant colonies. Frans Post was one of the first European artists to travel to the New World. He was hired by Prince Johan Maurits to travel with him and a team of scientists and artists to document the newly acquired Dutch possessions in Brazil. From 1637 until 1644, the young Post traveled and worked there, making both sketches and fully developed paintings of the local topography. Eighteen such paintings, all of approximately the same size, were presented to the French King Louis XIV by Prince Johan Maurits in 1679; however, only seven of the original eighteen canvases are still known today. Although there is a paucity of works dating from his Brazilian sojourn, Post produced many views of the New World upon his return to Haarlem. Indeed, Post continued to produce images of Brazil until his death in 1680. Painted almost twenty years after Post returned to Europe, this composition blends both real examples of Brazilian flora and fauna and imaginary landscape elements. Four prominent trees, including coconut, palm, and papaya, fill the left hand portion of the panel, while an exotic snake, armadillo, and other New World creatures wander in the thick growing vegetation that spreads from left to right across the foreground of the composition. The dramatic gestures of a group of natives in the right foreground draw our eyes back into the composition along a diagonal path that leads to a hut and raised platform on which laborers appear to be drying sugarcane. The right middle ground of the composition is dominated by the prominent white plantation house that sits on top of a hill. The mill, complete with thatched roof, water wheel, and a number of workers occupies the space below the house. A panoramic landscape is visible beyond. The jewel-like blue tone of the sky and loose, fluid brushstrokes are characteristic of Post's style in this later phase of his career, and the imagined composition as a whole makes this a type of New World capriccio, with the artist blending his memories of Brazil with his clients' desire to own a bit of the exotic locale for themselves.